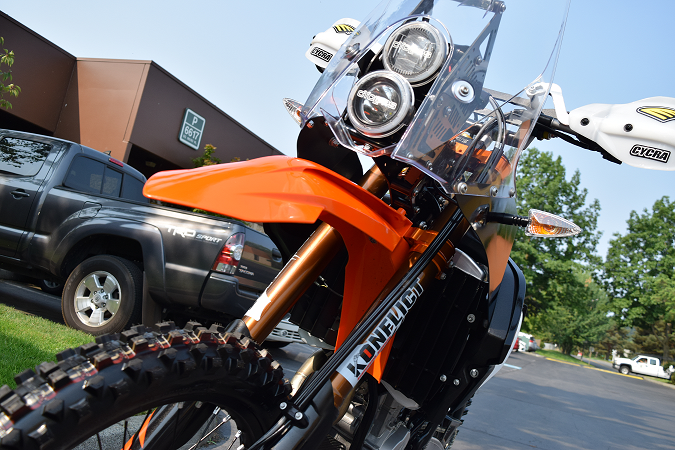 Multimedia with Konflict Motorsports & Suspension Inc.
Konflict Motorsports recently concluded a KTM 500EXC Rally Replica build prominently featuring the Nomad-ADV Travel Tower which provides a windscreen and functional tower for enthusiasts and long-distance riders looking to take on more than just a few miles of trail. With a Rekluse Clutch system, Cyclops Adventure Sports Lighting system, Fasst Co. FlexxBars, SicAss Racing EasyFit Under fender removal system, and our top level KM3 Suspension Package featuring a full revalve, respring, and Kashima coated upper tubes with hi-tensile strength Ti Nitrate lowers with Type III Hard Anodized Black fork lugs and various hard parts including the Ares integrated axle-bloc disc-guard. Konflict is happy to provide full-custom build services to our customers; we start with a new bike and tailor the platform, from top to bottom, to the individual. Check this bike, many more featured bikes, on our own site in the upcoming Konflict Workshop section. GoldenTyre GT216 AA Fatty Front 90/100 21" & GT333N Rear 120/100 18"
We have been testing with Golden Tyres since late November both here in the PNW as well in Southern California high deserts with an unmatched level performance and durability of current tires we have tested with.